The celebrated pianist and organist, who found fame accompanying silent films, was born in Clerkenwell, in London, in 1906. As a child she suffered chest problems and, when she was 10, on the advice of their doctor, the family moved to Southend, taking up residence at 132 Southchurch Road. Her Italian father, Constantine, had conducted a cinema orchestra at the Angel, Islington and, at the tender age of 12, having taken music lessons, Ena was appointed organist at the Church of the Sacred Heart, in Southchurch Road. Leaving school at the age of 14, in 1920, her first job was playing for ‘Thé Dansant’ (a dance, popular in the 1920s and 1930s, while afternoon tea was being served) at the Palace Hotel in Southend. Unfortunately she got so bored she used to prop a book up on the piano, but one day a message came down to the effect “Miss Baga, we do not pay you to sit and read books in public”! No doubt eager to move on, Ena’s next job was at the Palace Theatre, her first in a theatre, playing piano in the Pit for a mixture of live performances and short bioscope (film) shows. She also doubled on violin, even reaching Second Violin. She also played piano for silent films in Southend at, amongst others, Garon’s, in the High Street, the Strand, in Warrior Square and the Rivoli, later the ABC, in Alexandra Street, and, in Westcliff, at the Mascot. Her career blossomed, and she soon moved to London, playing at the New Gallery on Regent’s Street and the Tivoli in the Strand. In 1932 she was invited to Balmoral to accompany Chaplin’s The Gold Rush before George V and Queen Mary. During the war she replaced Reginald Dixon at the Tower Ballroom, Blackpool, while he was in the RAF. 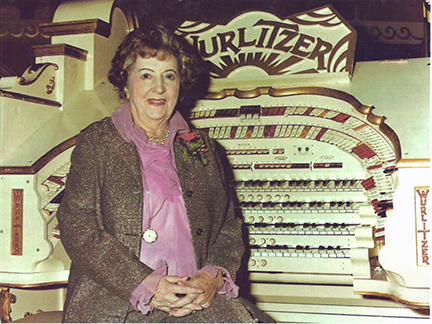 After the war, with cinema organs falling into disuse, Ena adapted to the new electric organs and re-modelled her career through TV appearances, recordings and silent film accompaniment. She died in 2004 at the age of 98. Ena’s three sisters were also accomplished organists, with Florence (married name de Jong) being especially talented and the equal to Ena. This page was added by Ian Grant on 29/04/2014.